Carbon monoxide elimination from the body. Blood oxygen tension is a determinant of the rate of carboxyhemoglobin elimination. Like CO uptake, loss of CO from the body is a slow process at normal atmospheric pressure and concentration of oxygen (21%), with a time to 1/2 the starting concentration of approx. 4.5 hours. 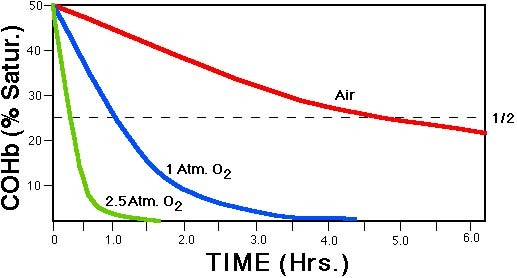 CO removal can be speeded up by raising the oxygen concentration, as with bottled gas containing greater fractions of oxygen, or by placing the victim in a pressure chamber where he/she can be treated with oxygen partial pressures of over 2000 mmHg for 30-120 minutes, called hyperbaric oxygen therapy (HBO). This increases the amount of oxygen dissolved in the blood plasma and forces CO off the hemoglobin, allowing it to carry oxygen once again. Also, see Other advantages of HBO. Carboxyhemoglobin (COHb) concentrations at an earlier time can be estimated by the use of a nomogram.